How Are Cold Headed Rivets Produced? Cold heading refers to a process that utilizes die forms and punches in order to produce parts in different shapes from metal wire. The cold heading process offers a number of crucial advantages, including the ability to produce parts with exact specifications in a reliable manner. As the name indicates, cold heading does not involve the use of heat in order to reshape raw material. Instead, force is utilized in order to push material through a die and form a new shape. Among the many parts that can be produced are cold headed rivets. The cold heading process, also known as cold forming, starts with metal wire. Based on the final application for the product, the wire may be variable grades of brass, copper, steel, or other alloys. Wire is fed into the process and is then cut off at a length that will produce the precise volume required for the final product. From that point, the process continues by forming the head of the final part. One of the reasons that the cold forming process is commonly used for the production of rivets and other fasteners is that a specifically shaped head is often required. The shape of the head can be created with a punch, a die, or sometimes with a combination. In some instances, a cold headed rivet may need to be machined or threaded after the cold heading process is finished. The completed part is then heat treated in order for the metal to harden and anneal. 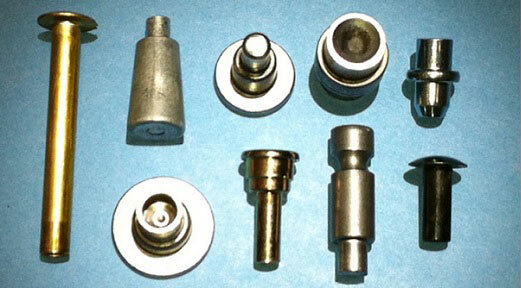 During the finishing process, the surface of the part may be cleaned or coated, based on the specific application. The cold heading process is a type of extrusion, but it does offer a distinct advantage over other methods involving extrusion. For instance, this method can be utilized on materials that may be tolerant to heat. Cold headed rivets also tend to be more cost effective than machining because none of the feed stock is wasted. In addition, cold heading is also less expensive than heat-involved processes because the process is so quick and can produce large numbers of designs.